In a recent vlog posted by popular YouTuber, Thomas Heaton, something concerning safety in the mountains was highlighted to me and it is such a simple fix with a little bit of prior planning and knowledge. I’m not going to sit here and have a go at Tom because I hold a lot of respect for him, I’ve been following his channel since the start and his videos are an amazing inspiration for me, particularly when I’m lacking outdoors time. Also in this instance Tom did exactly the right thing setting a very good example (probably unbeknown to himself). He was in completely unfamiliar territory having never been there before (Ogwen Valley) and wasn’t sure of the weather forecast for the following day; nor did he have a signal to find out. His decision was to NOT go up high the following morning, instead he opted to stay low in the valley by the road and comfort of his fantastic custom camper van (check it out). His decision was probably supported by the fact that he wasn’t feeling great; another very wise move. There is a lesson that can be learnt from this situation, prior planning; which may have given Tom more options the following day. There are a few things he could have done to prepare and mitigate the potential dangers, which therefore increases confidence. 1. The easiest option, Mountain Weather Information Service (MWIS). The mountain weather information service is an exceptional tool providing daily updates on the conditions of most UK mountain regions. It gives you the latest detailed synopsis for the day including cloud levels, how much rain, freezing level and the effect the wind can have on you. We all know that the UK weather can change (and therefore forecasts) regularly and luckily the MWIS also provide an outlook for the next 48 hours on the same report. Now anyone who knows me, will know that I don’t advocate relying on smart phones, tablets etc. for anything to do with the mountains, they are a great ‘aid’ but that’s about it, they should never be default. Luckily the MWIS provide a downloadable PDF or text format document that you can also print. Downloading the latest report for the required region prior to leaving town (prior to losing signal) would mean that you still have access to at least a good detailed weather forecast for the next few days. Better still would be to print it (and keep it waterproof) that way if your phone fails for whatever reason you still have it. The Mountain Weather Information Service (MWIS) a fantastic resource. 2. The other option, Learn About the Clouds. No I’m not suggesting you go and do a science degree in meteorology, far from it. There are a number of resources out there that you can gain some understanding from the various cloud formations and what to look out for, as well as weather fronts and the kind of weather they bring. You will be surprised at how simple it can be and with just a little knowledge you can almost predict rainfall approximately 6 hours ahead. The best way to learn this would be via a professional training provider like those authorised to deliver the Mountain Training Association’s Hill & Mountain Skills courses. Quite like what I deliver on my Photographers Mountain Confidence Courses. You will gain first-hand knowledge from a qualified professional who has most likely been assessing weather fronts for a long time. You know the ones that gaze suspiciously at the horizon with a raised eyebrow. 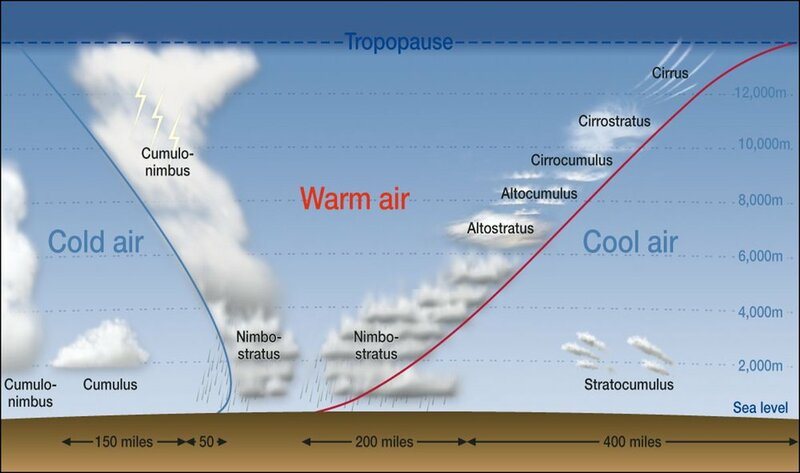 Understanding the effect of a Cold or Warm weather front can be vital knowledge. Weather for Hillwalkers & Climbers by Malcolm Thomas (I learnt a lot from this one, very simple to understand). Hillwalking. The official handbook of the mountain training walking schemes. In a nutshell, you should never expose yourself to a potentially dangerous environment unless you are confident that you have the right information or experience; simple planning or prior research of the weather can give you just that. The MWIS gives you all you need to know and there is little excuse for not having it to hand. Having an understanding of weather and what may happen is great knowledge to take with you anywhere. Combine the two and you’ll have all the confidence you need to tackle most mountains (provided you are sensible with it that is). Literally thousands of people head for the hills every year without checking the weather first, some know their limits and are sensible, just like Tom was on this occasion. Others however come unstuck and rely on the good will of the many Mountain Rescue Teams who work tirelessly to help those who unwittingly risk their lives and on occasion the lives of others. As I said at the beginning, I’ve followed Tom’s YouTube channel since the start (highly recommend it) and I also saw his talk at the Photography Show on the Great Outdoors stage. It is clear that Tom is very experienced and comfortable in a mountain environment, yet he still didn’t take any unnecessary risks; a good example. As I write this I haven’t seen the next video to this trip, but if he did stay by the van the following morning he will most certainly be glad he did, the views from the other side of Llyn Ogwen can be simply stunning. I probably don’t need to point out that understanding the weather and planning ahead is just a very small part of staying safe in the mountains. There is a plethora of advice out there on Google, a very useful website is mountainsafety.co.uk. Stay Safe! If you enjoyed this or found it useful, please share it with your friends on social media using that funny little share symbol. And if you have already dismissed that annoying pop up that asked you to subscribe to my newsletter and updates, then you can find another way to subscribe just over there on the right (down below if you’re on a mobile).